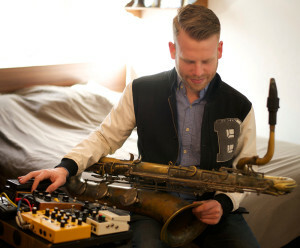 Armed with little more than his baritone saxophone and analogue synthesizer2, Brooklyn based musician Jonah Parzen-Johnson is poised to take over Greensboro when he performs at New York Pizza this Friday, June 19. Parzen-Johnsons first full album, Remember When Things Were Better Tomorrow, debuted on June 2. You can catch the official video for the single I Wrote a Story About You, Without You. I had to a chance to interview Parzen-Johnson over the phone this past Wednesday and talk to him about his new album, New York, and even superheroes. Me: Jonah, you have mentioned in a couple of interviews that the song and video for I Wrote a Story About You, Without You concerns imagining the stories of strangers you see on the subway and throughout daily life. Can you recall any specific stories you’ve come up with? Jonah: The stories I come up with tend to be more general than that. I see what people are wearing and start to wonder about where they’re going, who they’re going to meet and what kind of imaginary life they lead. Me: Even though your music is instrumental jazz, the songs tend to have a strong narrative quality to them, despite the fact there are no lyrics. Is this intentional on your part? If so, how do you go about achieving that effect? Jonah: The narrative quality of the songs is very important to me. I come up with the song title first and then filter and distill the melodic element through that. Hopefully what comes out at the end is some sort of narrative for the listener. Me: You also play with a group called Zombo Junction. How does playing in a group differ from your solo work? Jonah: Zombo Junction is a collaborative group with 9 people. 9 different experiences to call upon. It can be really energetic but I also like the intimacy that playing solo can provide. Me: Many of the articles written about you and the new album mention an Appalachian folk music influence on your songs. Is this intentional on your part? If so, how has Appalachian music influenced you? Jonah: I would definitely say I’m influenced by Appalachian Folk Music. I was very influenced by the solo voices you can find on the Smithsonian Folkways recordings of Mountain Ballads and the music on the Harry Smith Anthology of American Folk Music. This music heavily influences my aesthetic in presenting solo music in an often unadorned way and also my choice to try and incorporate vocalizations into my playing and focus on including passages of completely unaccompanied saxophone. Log in | 44 queries. 0.529 seconds.